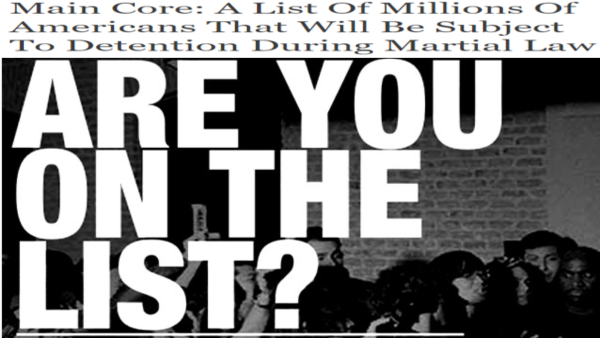 In this January 28th of 2019 story over at the American Media Group, author Medeea Greere reminds us of 'Main Core', a US government 'threat list' allegedly containing the names of over 8 million Americans who would be 'hunted down, rounded up and detained' should martial law be declared, a list going back all the way to the 1982 and President Ronald Reagan's "continuity of government operation plans". Main Core is the code name of an American governmental database that is believed to have been in existence since the 1980s. It is believed that Main Core is a federal database containing personal and financial data of millions of United States citizens believed to be threats to national security. The data, which is believed to come from the NSA, FBI, CIA, and other sources, is collected and stored without warrants or court orders. The database's name derives from the fact that it contains "copies of the 'main core' or essence of each item of intelligence information on Americans produced by the FBI and the other agencies of the U.S. intelligence community". The Main Core database is alleged to have originated with the Federal Emergency Management Agency (FEMA) in 1982, following Ronald Reagan's Continuity of Operations plan outlined in the National Security Directive (NSD) 69 / National Security Decision Directive (NSDD) 55, entitled "Enduring National Leadership", implemented on September 14, 1982. 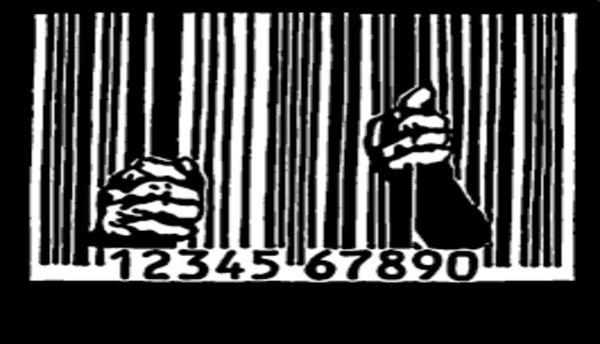 While 'Main Corp' allegedly dates back to 1982, 'Rex 84' was another previously classified US government program to 'round-up' and 'detain' law-abiding American citizens who the government deemed a 'threat' with those documents spelling out one such possible 'threat' as 'those opposed to a US military invasion abroad'. Rex 84, short for Readiness Exercise 1984, was a classified scenario and drill developed by the United States federal government to detain large numbers of United States citizens deemed to be "national security threats", in the event that the President declared a "State of National Emergency". The plan was first revealed in detail in a major daily newspaper by reporter Alfonso Chardy in the July 5, 1987 edition of the Miami Herald. Possible reasons for such a roundup were reported to be widespread opposition to a U.S. military invasion abroad, such as if the United States were to directly invade Central America. To combat what the government perceived as "subversive activities", the plan also authorized the military to direct ordered movements of civilian populations at state and regional levels, according to Professor Diana Reynolds. Existence of a master military contingency plans (of which REX-84 was a part), "Garden Plot" and a similar earlier exercise, "Lantern Spike", were originally revealed by journalist Ron Ridenhour, who summarized his findings in an article in CounterSpy. Transcripts from the Iran-Contra Hearings in 1987 record the following dialogue between Congressman Jack Brooks, Oliver North's attorney Brendan Sullivan and Senator Daniel Inouye, the Democratic Chair of the joint Senate–House Committee. Long before Ketcham and Shorrock published stories outlining 'Main Core', Steve Quayle was told by a former official with the EPA who later paid with his life that they had been building 'incinerator's' to get rid of human bodies under toxic waste budgets in a national emergency that required the 'rounding up' of Americans who were deemed to be threats to what we now know as the 'deep state'. Told by his source 15 years ago that the government had created lists of Americans, 'red-list' Americans to be terminated, 'blue-list' including law enforcement and military, 'slaves' to the globalists who'd help to round-up the 'red-listers' and who would later be 'terminated' afterwards themselves and 'green-list' Americans, those chosen to be 're-educated'. While the 'red-list' has long been considered 'conspiracy theory' by the mainstream media, who believes that CNN and the rest of the fake news outlets would ever report upon sinister US government plans to round-up and slaughter innocent Americans? And with Democrats in the state of New York actually legalizing the murder of their own children as Mike Adams reports in this new story over at Natural News, how long will it be until they start murdering people for simply wearing MAGA hats, what the left have insanely compared to Nazi German swastikas? As Adams asks within his story, "do you really think they won't murder Christians and Trump supporters next?" While most Americans might find it hard to believe that our own public servants might 'round-up' Americans in a time of national emergency and hold us against our will without any crimes being committed, as this new story over at Concerned US Patriots that Steve Quayle had linked to on his website Tuesday morning reports, it's much easier to understand after what the head of FEMA Brock Long allegedly told a recent gathering of FEMA agents. Allegedly comparing human beings to 'cattle' at a recent FEMA meeting, Director Long also allegedly told his agents that "citizens who question the agency’s mission should be treated as hostile combatants". And while that claim of a source of the Concerned US Patriots story is one that we are unable to confirm at this moment, the claim absolutely fits in line with much of what we've been witnessing across America over the past several decades as our Constitutional Republic has slowly devolved into a 'boiling frogs police state' that the globalists have been building up in America ever since 9/11. For anyone who still believes that the 'red list' might be just a 'conspiracy theory' even after learning about 'main core', we ask you to listen to former police officer and Patriot Jack McLamb in the 2nd video below, a video in which McLamb stands in front of the US Capitol and gives Americans a warning which far too many people have closed their ears to. McLamb, a US military Veteran and retired Phoenix, Arizona police officer who died back in 2014 at the age of 69, had often spoke out against totalitarianism and the 'new world order', the global government that we've been witnessing materializing for the past several decades. And in the video, a rally for former Texas Congressman and US presidential candidate Ron Paul, McLamb warns us of the 'red list' and 'blue list' and 'FEMA camp roundups' of law-abiding patriots opposed to the totalitarian government that McLamb claimed was being slowly introduced here into America. Thankfully, McLamb wasn't the only US Patriot working within the law enforcement community who'd refuse to carry out unlawful and un-Constitutional orders against the American people as the Organic Prepper reports in this new story, Sheriffs in the state of Washington are refusing to enforce un-Constitutional gun laws there. And as Steve Quayle recently warned us, who'd really put it past the 'swamp creatures' still within President Trump's government to take matters into their own hands during a national emergency based upon 'continuity of government' laws passed long ago such as Rex-84, NSD-69 and NSDD-55 and start rounding up, detaining and slaughtering patriots? 'Killing in the name of a national emergency', the American people would be toast if not prepared for such a stasi-style round-up here. Back on January 26th we published this story on ANP within which we asked if America was now being governed by two opposing factions with proof emerging that Barack Obama and his globalist minions had been going around the world, making deals and committing treason. As Freedom Outpost had reported, the Obama regime loyalists were acting like they were still in charge and as this new story over at the American Thinker concludes, "Time for the man at the top to show who is really in charge. Before it’s too late." And as ANP was recently asked, why have those who loyally stood by POTUS Trump during the election been 'thrown to the wolves' while alleged leakers such as Kelly Ann Conway and Jared Kushner kept around and even pampered? With the recent deep state lynching of Roger Stone hinting that nobody is immune in 2019 to 'Robert Mueller's stasi' and the 'deep state' terrorizing the masses and showing just how far America has fallen down this totalitarian rabbit hole, as John W. Whitehead points out in his new story, "no one is spared from this American nightmare". 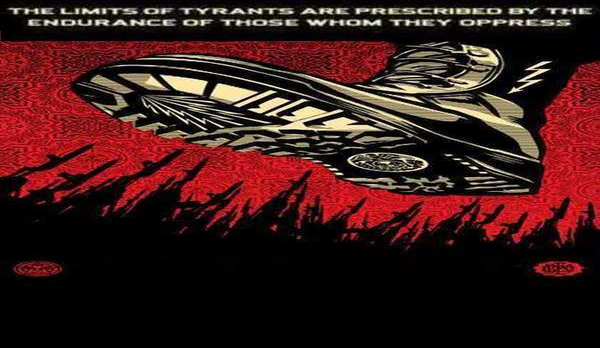 So while still a long shot, might a takedown of both VP Mike Pence and President Trump lead to these Orwellian programs being put into action against the American people, specifically President Trump supporters, with his supporters possibly taking to the streets 'en masse' against those who via coup would have successfully overthrown the results of the 2016 US election? As we have been warned, these 'continuity of government' laws had been put into place over the years for a reason. While the first video below is several years old, we hear from Tim Shorrock, one of the journalists who first exposed 'Main Core' and while Shorrock's book goes after the Bush administration and their blatant abuse of surveillance tactics while spying upon Americans, as those who've been paying attention since Bush left know, those policies were continued and increased under the 'reign of terror of Barack Obama' during his 8 years in office here and are all still in play in 2019. In the 2nd video below we hear from Officer McLamb while the final video below, videographer JT Hickox takes a look at present days news stories from not only the US but Venezuela and elsewhere around the world and tells us why he believes we may be rapidly heading towards a time when a national emergency is imposed, with the ADEX list, Rex-84 and all of the other 'continuity of government' laws written to complete the takedown of 'liberty' in America fully imposed upon us.